The Pearl Source imports their Akoya pearls from the saltwaters of Japan, grown in the Pinctada fucata oyster. Japanese Akoya. 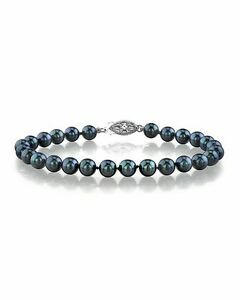 5.5-6.0mm Akoya Black Pearl Bracelet- Choose Your Quality. Quality Pearl - Choose Your Quality (View Akoya Pearl Grading).